The black sheep of Fallbrook is back . . . And he's in for the surprise of his life. There were a lot of pieces to the plot of this one that should have made me hate it, but all together it actually made for an incredibly interesting read with an unexpected twist a rather standard trope. The break-up between Brody and Rain back in the day didn't make a lot of sense, but then again, plenty of break-ups never do. And what happened directly afterward, as awful as it is, is actually pretty true to life. 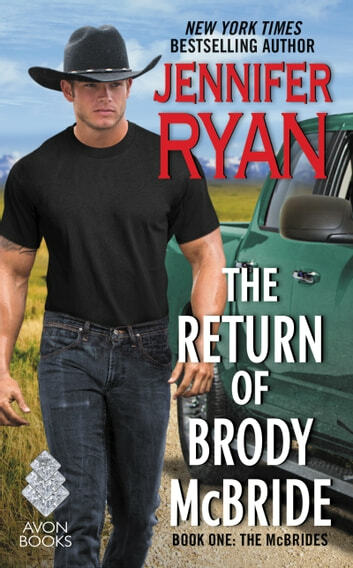 The short of it is that Brody and Rain broke up, he had a one-night-stand with someone else, and then they got back together for a very brief moment before he headed off into the military. So instead of coming home years later to a surprise kid, Brody came home to double the surprise. As much as that initial detail pissed me off, it also had me wondering how it would all play out. It's impossible not to feel bad for Rain. The guy she was in love with knocked her up and then took off for the wild blue yonder before either of them knew what was coming in nine months. But worse, his one-night-stand also got pregnant, leaving Rain not only to deal with the small-town shame of being an unwed and essentially abandoned mother, but also having to deal with the whispers, looks, and gossip surrounding the fact that she wasn't the only one he left in that condition. No matter what she did before or after, you've just gotta feel something for a woman in her shoes. Fast forward several years, and Brody is back in town, out of the military, and looking to reconnect with Rain. Discovering what he'd left behind was the shock of a lifetime, but how Rain handled it all was incredibly admirable. She'd held her head up, raised her daughter, and even informally adopted his other daughter from a truly unfit mother. What follows, of course, is Brody's desperate attempt to make up for the wrongs he's done, not to mention some unwelcome drama from Baby Mama #2. It should have been hard for me to accept a story about a heroine abandoned while pregnant, the town whore also pregnant by hero at the same time, and all the drama said whore put on the table upon the hero's return, but somehow all this combined just reeled me in. I think part of it is simply that the plot was rather unique without making a mockery of everything, and part of it is just Jennifer Ryan's writing. While I was angry and judgmental and betrayed right alongside Rain, it was also very clear that Brody had simply made a very stupid (and not uncommon) mistake and was willing to do anything necessary to make up for it as much as possible, and he never pulled the custody card to get what he wanted. In the end, what should have been an overly dramatic mess of a story turned out to be thoroughly entertaining and unique, and I definitely recommend it to anyone who's looking for a different kind of second chance romance story. I loved this book so much. In fact, this series of three books has been one of my favourite ever. I highly recommend them, you will not be sorry. It took me a long time to be able to go on to my next series, because Brody, Owen and Dylan took up a big space in my mind and I didn't want to replace them. The Return of Brody McBride. Loved the story. I am deeply emotional, intense and quietly captivating of the story between Brody and Rain. I stayed up late to finish this story and keep one anxious to get to the conclusion. However I am really disappointed of not seeing the marriage scene between Brody and Rain. Overall, great book.